Set in a Japan after the apocalypse in the future in 2071, the world has been almost entirely destroyed by these mysterious monsters known as the Aragami. An organization calling itself Fenrir was established to exterminate Aragami using 'God Arcs', weapons specially made from Aragami cells. Those who specialize in exterminating Aragami are known as God Eaters. Their God Arcs originally could only keep a single form, however a new type has been discovered that can switch between gun and blade form. Since then, they have been classified new-types and the previous as old-types. 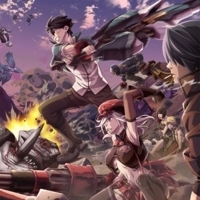 726 users rated God Eater [TV].